Today marked a significant occasion for the ASH team as Richard Lucas took over the Managing Director reins from Steve Braithwaite. Steve will now take on the title of ‘Founder - CTO’ and focus his attention on ASH’s growing technological expertise and wider influence. What’s with the bell? One of the great things about ASH culture is a celebration of team member’s achievements, however small or large. 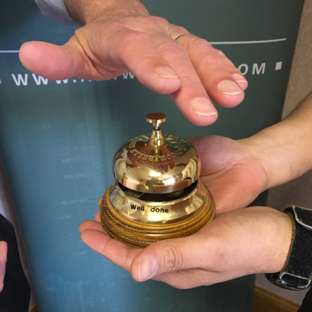 From the completion of significant project development milestones through to bugs being fixed, the bell is rung regularly at the office. As such, the handing over of management reins seemed a suitable occasion to represent the handing over of ASH culture too.